O’Grady Quinlan Academy teachers have undergone extensive training. The teachers meet the training required to pass the rigorous TCRG Certification administered by An Coimisiun le Rince Gaelacha, the largest Irish Dance organization in the world. An Coimisiun, established in 1927, prides itself on the high standard of testing that goes into becoming a certified teacher. It was An Coimisiún that first established a standard for Irish dance teachers, and later for adjudicators. This extensive certification process is not required for all Irish Dance organizations. An Coimisiún has grown the world of Irish dance, publishing a handbook of Céilí dances, and established Oireachtas an Rince (The World Championships). Irish Dancing is ever growing, with nine Regional Councils overseeing a vibrant Irish dancing scene in Ireland and Britain and organizations such as the I.D.T.A.N.A. in North America, R.T.M.E. in Mainland Europe, A.I.D.A. in Australia and T.I.D.A.N.Z. in New Zealand. The influence of An Coimisiún continues to spread throughout the world and they can proudly say there are active classes in continental Europe, in South America and as far away as South Africa. O’Grady Quinlan is proud to be the only certified school in the Lehigh Valley that is registered with An Comisiun le Rinci Gaelacha, home to 8 TCRG and 1 ADCRG. Colleen began dancing in 1992 at the age of twelve with Maureen O’Grady and instantly fell in love with the art form. She was soon competing in Regional and National Competitions and dreaming of one day having her own school. In the year 2000, at the age of 20, she passed her TCRG exam and founded the Quinlan Academy of Irish Dance named after her grandparents. Now, after merging schools with Maureen O’Grady in 2005, she is co-owner of the O’Grady Quinlan Academy. Colleen continues to train dancers to reach the highest level of dance, many of which have gone on to win Regional and National titles. Her students have also had competitive success in Ireland, having several placed in the top ten at the World Championships and All Ireland Championships. In order to further her career in Irish dance she decided to take on the challenge of becoming an adjudicator. She passed her examination in 2012 and is now a certified TCRG and ADCRG with An Comisiun le Rince Gaelacha. Colleen now has the opportunity to adjudicate local, national and international competitions. Colleen currently resides in Bethlehem, PA with her daughter Grainne who is an Open Champion dancer herself! Colleen enjoys sharing her passion for Irish Dance with every dancer who walks through the door. It is her missions to make sure dancers not only learn to dance, but learn positive life lessons that will help them through every step of life! Maureen brought the passion of Irish dance to the Lehigh Valley, after earning a Bachelor’s degree from the University of Delaware and a Master’s degree from Lehigh University. Beginning at age 4, Maureen studied under Peter Smith, the esteemed President Emeritus of An Coimisiun le Rinci Gaelacha. Maureen enjoyed much competitive success as she competed at numerous championships and also demonstrated a desire to keep the traditions by going out into the community to share this inspiring form of dance and then eventually by getting her TCRG. Maureen is proud to say that Colleen Schroeder was in her very first class! A teacher of children by heart, Maureen has recently retired as an ESOL instructor in the Allentown School District where she worked for over 16 years. Maureen lives in New Jersey with her husband Patrick and loves to ignite a fire for dance in all the children that step foot into the studio! Katherine began dancing at the age of 3 at the Cora Cadwell School of Irish Dance. During her 14 competitive years of Irish dance, she won many championships including the Leinsters, All Irelands, Great Britain’s and All Scotlands. At the age of 17, Katherine auditioned for Michael Flatley’s Lord of the Dance and was accepted to the show. She spent the next three years performing with the show primarily in Las Vegas and also completed a coast to coast tour of America. At the age of 22 Katherine passed her TCRG. In 2004 Katherine moved to Philadelphia and for the past 11 years has been actively involved in teaching Irish Dance at many schools in North America. Katherine joined the staff of OGQ in January 2013. Katherine lives in Nazareth with her husband Dan and her four children Taidhg, Cian, Aoibhe and Senan. Katherine loves sharing her passion for Irish dance with all our students and loves to help train them to be the best dancer they can possibly be. 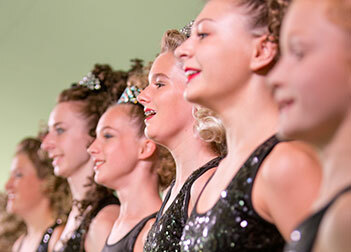 Learn about the Irish Dance classes offered at O’Grady Quinlan Academy of Irish Dance.